the extension of the original rental term. It may be stipulated in the original agreement that the lease shall be automatically renewed after the initial term, on a month to month basis and under the same conditions. The landlord could include a provision for annual escalation in the rent. 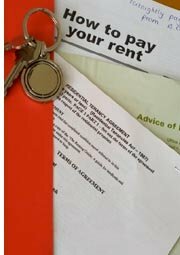 However, the tenant and landlord may prefer to have an agreement for another year, as opposed to the month to month arrangement. The lease renewal agreement negates the need to prepare a whole new document, whilst still allowing for amendments to the original agreement. If you've made use of our free Guarantor Agreement there is no need to do a renewal of that document. It is stipulated that the guarantly shall remain binding for any extensions of the lease. Tenants invariably anticipate an annual increase in rent. The property owner should increase the rent regularly by relatively small amounts and keep the rental market related, rather than implementing a big increase after a couple of years. The landlord must also decide whether an increased security deposit should be stipulated in the renewal document and which other amendments must be provided for. Having said that, we value quality tenants and would not want to risk losing one because we are not negotiable on the rental. One month vacancy (not to mention an unknown new tenant) will immediately negate any gains on a rental increase. A rental application form, rental agreement and guarantor agreement can be accessed from our Main Real Estate Contracts page. Whereas the Landlord and Tenant entered into a lease agreement which started on the ________day of ________________________20____ and expires on the __________day of ________________________20____ (hereinafter referred to as the "Original Agreement"). The Landlord and Tenant hereby agree to renew the Original Agreement for a further term of ___________ year(s) commencing on the ___________day of____________________20____ and ending at midnight on the ___________day of ______________________20____ (hereinafter referred to as the "Renewal Term"). 5.1 The monthly rental during the Renewal Term is an amount of ____________ (in words: ________________________________________). 5.2 An additional security deposit of ___________ (in words: __________________________________) shall be payable within five days of commencement of the Renewal Term. Note: Rent stabilized properties have restrictions, procedures and state specified forms. Consult with legal counsel to advise on specific laws in your area. Before using our sample renewal agreement you need to confirm the timing determined by law to issue notice of renewal to the tenant which can be anything between 60 and 150 days before expiry of the current lease.